Long gone were the days where Godzilla and his rampage of utter destruction acted as an allegory for the hazards and repercussions of nuclear warfare. As Toho’s series became more and more popular, the King of Monster slowly found himself becoming tamer, even heroic, so as to appeal to a wider audience – specifically children. This is evidently the case in Toho’s fifth installment in the Godzilla series: Ghidorah, the Three-Headed Monster. In order to evade political turmoil in her home country, a young princess flees to Japan to be guarded by a somewhat hesitant, but determined detective. However, things go amiss when the princess’ plane is destroyed in mid-air, cancelling his mission before it rightfully begins. At around the same time a meteor shower plants a meteorite on Earth that instantly draws the attention of nearby scientists due to its magnetic properties, much to the disdain of a prophetess who makes her presence known all around Japan, warning the natives of incoming destruction. Due to her uncanny resemblance to the princess, the prophetess becomes the target of the police, the media, and a band of assassins sent from her rival country to finish the job. It is clear that the focus of the drama lies on the human characters, and their struggle to both understand and prevent the peril that looms over them throughout the first act of the film. The problem here is that the characters are not necessarily engaging enough to sustain your attention. They are characterized enough for a monster film where they are not the main attraction, but the story is not much to praise either. While there are no blatant contradictions, the incongruity of logic is unmistakable. This is alleviated somewhat when the monsters take the stage about half way into the film, but not as much as one would hope. As aforementioned, the terror of these beasts is gone. While there are impressive shots of Godzilla and Rodan wrecking their signature havoc, they soon become near parodies of themselves when their epic battle is reduced to a game of volleyball played with a boulder. Godzilla’s atomic breath is traded for an affinity for hurling and punting boulders, and their new taste for comedy comes off as overly silly, even for this kind of film. 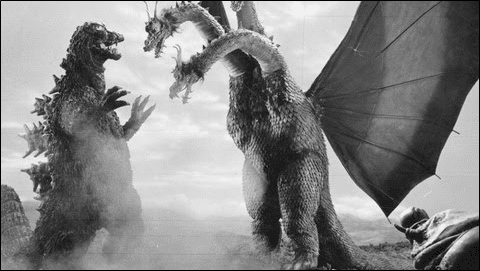 This is compensated for with the debut of King Ghidorah in the series, whom is quickly confirmed to be a greater terror than Godzilla ever has been before, but the failure to truly provide the all-out, no holds barred monster mash as promised leaves this film feeling a bit incomplete. This could have been the best of the series so far – as nonsensical as some plot points may be, the human side of the story is at least an interesting quasi-political drama, albeit a simple one; and the premise of three monsters versus one super monster is awesome, but ultimately a tad anticlimactic. As it is, Ghidorah has to settle for just being enjoyable due to its campy feel and few moments of greatness, rather than being wholly amazing.